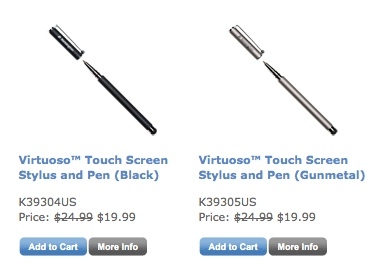 Kensington sale on iPad Stylus/Pen till end of month! We have mentioned many stylus choices here over the last year. Some have been basic little stubby ‘pens’, others have had character. This morning, Kensington sent us an email saying they where having a 20% off sale till the end of May. Right at the top of the list of their products is there stylus/pen combination writing devices. Now might be the time to buy if you have been fence sitting. Particularily nice devices for folks that handwrite on their iPads or have a need to draw.